We’re officially two months into the New Year – how are you keeping up with your resolutions and goals? If you, like me and so many others, made a goal related to eating healthier or cutting carbs, I have the perfect recipe for you today! 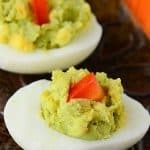 These Avocado Deviled Eggs are low carb with all the protein of eggs and the oh-so-tasty) health benefits of avocados. 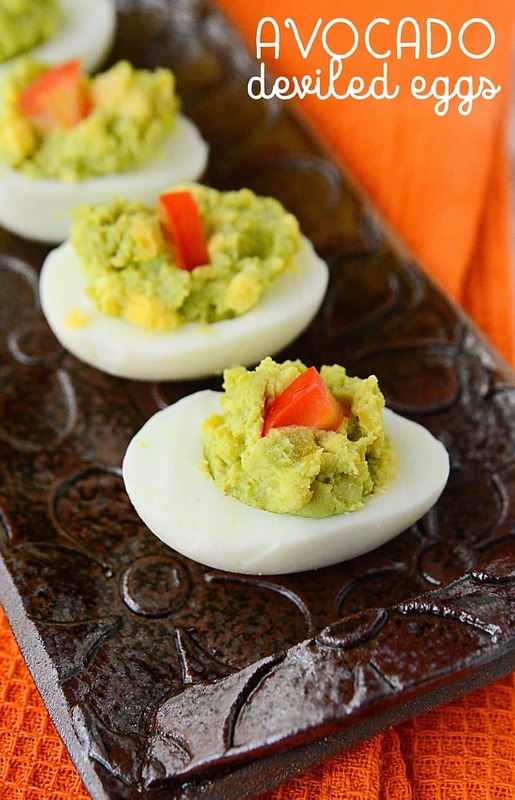 You’ll love these as a low carb snack! We eat a lot of eggs and I find the easiest way to cook them for recipes like deviled eggs (or just eating plain) is in my pressure cooker. I can usually cook 18 or so at a time and when you cook eggs in a pressure cooker, they peel like a dream and you get a perfect looking egg – which is great if you are taking them somewhere. 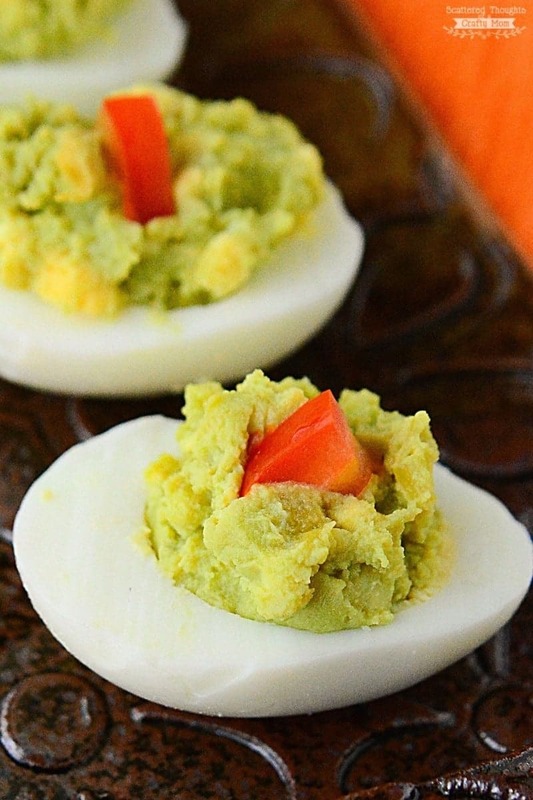 Another great thing about these Avocado Deviled Eggs? They’re EASY and customizable. 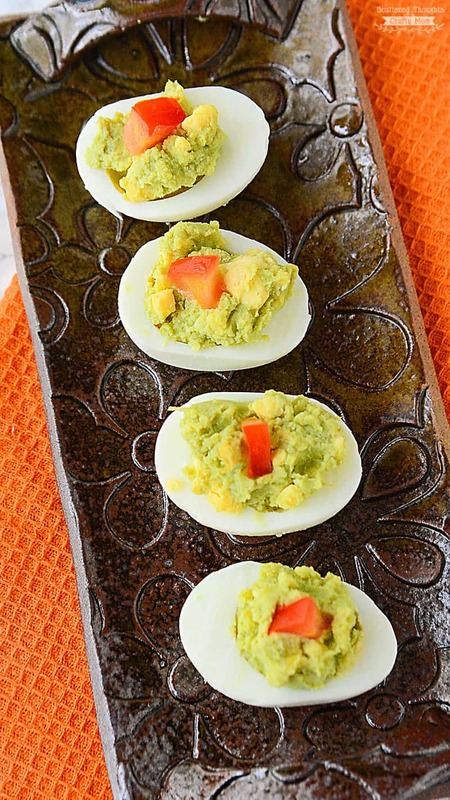 Really, you can make these with only four ingredients, though when I have guacamole on hand, I skip everything and just mix 1/2 cup of guacamole with the egg yolks. It’s also super easy to add a little kick with more hot sauce or skip it completely for a crowd that may not enjoy the spice. Whenever I make these for a party, I also make sure to leave a plate of them at home for me to eat as a guilt-free snack later! This recipe only uses 6 eggs but it’s very easy to double or triple it. Add salt and pepper, and optional hot sauce if using. Fold in the red onion and mix well. Spoon the filling into the egg cavities. Top with the tomatoes and garnish with optional cilantro. I’d like to make and take these to a St. Patrick’s Day event. Does your recipe really call for guacamole or the plain avocado? I may have to improvise! 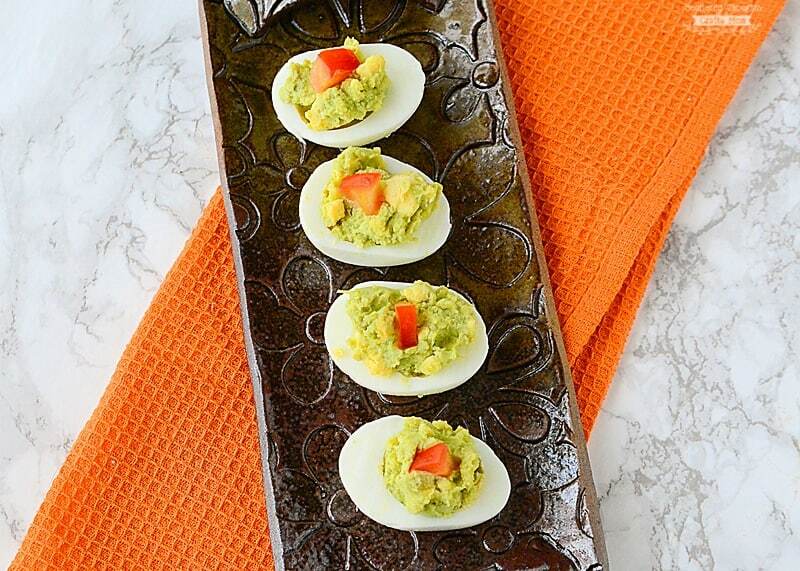 avocado, but I don’t see why you couldn’t use guacamole and leave out the onion and optional hot sauce. Thank you for your quick reply! Getting ready to try them now!